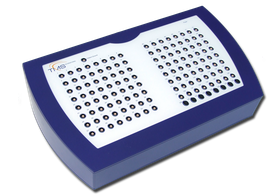 Sirius, a high density EEG amplifier with 64 - 128 channels, is completely compatible with the Galaxy sleep diagnosis system. In addition to the EEG channels 8 channels are available for signals like ECG, respiration or limb movements. EOG/EMG can be measured by using some of the EEG channels. The amplifiers have connectors for EEG electrode caps for easy EEG hookup. The built-in impedance measurement can be controlled with the Galaxy software. The high density EEG amplifiers are true DC amplifiers, making it possible to study slow EEG oscillations from zero Hertz. In combination with the flexible Galaxy system, offering you extensive analysis, reporting and exporting tools, the high density amplifier is a very powerful research as well as clinical tool.